The great Avicenna is well-known as a philosopher and physician who is popular worldwide as the father of early modern medicine. His most famous works are “The Book of Healing”, and “The Canon of Medicine”, a medical encyclopedia. He is also known as a great mathematician whose theories were taught in Europe until the 19th century. In 1952, a large mausoleum, a library with more than 8,000 volumes of books, and a small museum devoted to his works are have been built at the Avicenna Tomb. If you are interested to have a great view at the city, Avicenna Tomb is the place. In addition to the grave of Avicenna, there are also graves of Abu Said Dakhdukh and Aref-e Qazvin at the entrance of the mausoleum. Baba Taher was a Persian poet who lived in the 11th century. He wrote his poetry in the Hamadani dialect of the Persian language, who was one of the great Gnostics of Ahl-e Haqh. His Mausoleum is located at the northern entrance of the city from Tehran Highway, at the end of Baba Taher Street. In 1970, the mausoleum was reconstructed which consists of twelve external pillars surrounding a central tower. The Ali Sadr Cave with 11 kilometers length is one of the world's largest water cave, which is situated 75 kilometers to the northwest of Hamedan in a village by the same name. The cave can be reached via three routes. Firstly from Hamedan-Bijar via Lalejin Road, then by Hamedan-Tehran Road, via Nojeh Air Base, and finally from Hamedan-Salehabad Road. There are two options to choose from for visiting the cave. One is longer with more walking, however, in both ways, you will explore the beauty of the cave. 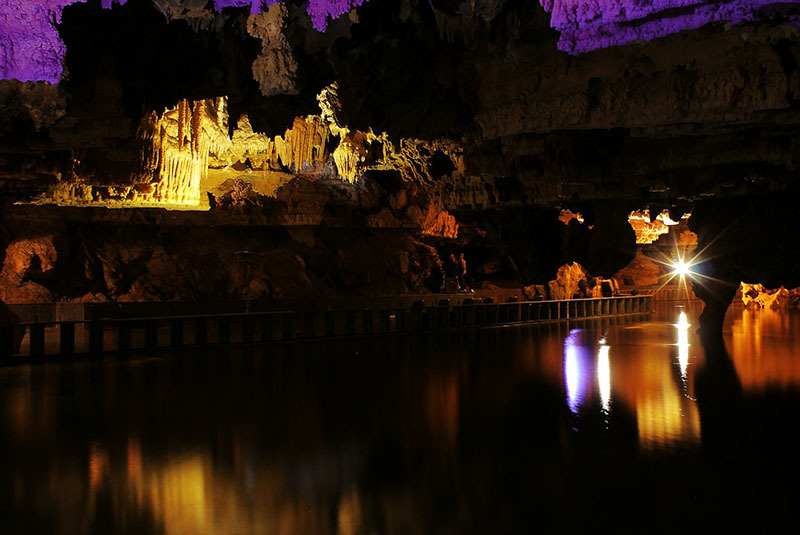 There are some walls with more than 40 meters height and deep lakes at the cave. The Ganjnameh "which literally means treasure epistle" Inscriptions was carved into the rock face of Mount Alvand in three different languages of ancient Persian, Elamite and Babylonian. This historic site is 5 kilometers away from the city of Hamadan. These inscriptions dated back to the time of Darius I and Xerxes I, consist of a genealogical account of the Achaemenid monarchs and the adoration of Ahura Mazda, the Zoroastrian God. It says “I (am) the great king Xerxes, king of kings, king of lands with numerous inhabitants, king of this vast kingdom with far away territories, son of the Achaemenian monarch Darius." Tomb of Esther and Mordechai is actually the most important Jewish pilgrimage site in Iran which is said to contain the bodies of Esther, the Jewish wife of Xerxes I, and her uncle Mordecai. The tomb is 2,500 year’s old which has a place for meditation and prayer as well as a beautiful courtyard. Inside the brick dome and upon the plasterwork of the walls there is some Hebrew inscription. The building was constructed in the 13th century on the site of an earlier tomb. The exterior form of this mausoleum, built of brick and stone, resembles Islamic constructions. It is believed that under this unsuspecting hill an ancient Median and Achaemenid city lies. The complex includes the Covered Ruins of Hegmataneh, two Armenian churches, and a museum. The ruins of ancient Hagmatana, date from the period of Median monarchs in the 7th and early 6th centuries BC. Numbers of objects, including some gold and silver tablets, have been discovered at the place during the scientific excavations. These findings indicate that the treasury of the Achaemenian monarchs was kept in Hagmatana. This well-preserved mausoleum of the Alavi family which dated back to the 12th century, is one of the most noteworthy monuments in Hamadan due to the magnificent quality of its stucco ornamentation, with whirling floral motifs on the exterior- walls and intricate geometric designs on its Mehrab. It is said that the monument was first built to be a mosque before being turned into a family mausoleum by the Alavid rulers of northern Iran under the Seljuk Empire. At the southeast part of Hamadan, you can easily find a square with the same name of Shir Sangi, in which the stone lion from 14th century stands. This statue is the only distinct, visible monument of the ancient city, Ecbatana. It is believed that the statues built on the order of Alexander the Great at the entrance of the city to act as a guard and protect the city. The Tepe Nush-e Jan situated at the 60 kilometers on the southern part of Hamadan. Five seasons of excavation between 1967 and 1977 reveal that the importance of the site lies principally in the architectural remains constructed in the eighth and seventh centuries BC when the Medes were the dominant population in central western Iran. Before Tepe Nush-i Jan was investigated there was little or no evidence for the archaeology of the Medes from their own homeland. Today other sites, such as Godin Tepe and Ozbaki Tepe, can be recognized as belonging to the same culture. Above all else, Nush-i Jan offers a striking picture of the achievements of the Medes, particularly in the field of architecture.